The Pazyryk Rug captivates our imagination because of its sophistication of weave, color and design and the fact that it is the oldest rug in existence. Found in 1949 on the steppes of Mongolia in a Scythians Prince’s tomb, the Pazyryk Rug along with other textiles had been frozen for over 2500 years. The Pazyryk Rug, which can be viewed at The Hermitage Museum in St. Petersburg, Russia, measures 6’x6’7” and was hand-knotted with 278 Turkish knots per square inch, using hand-carded and hand-spun wool. 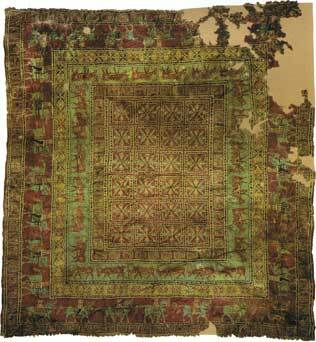 This textile had been dyed with plant and insect dyes from the Mongolian stepes. This masterpiece gives us a glimpse of the enduring meaning and purpose that textiles had to our ancestors. The story of the Pazyryk begins with the Scythians who from the 9th century BC began expanding out from central Asia into western Mongolia, Southern Russia and Europe as well as the Mediterranean and Egypt. They were said to be an ethnically diverse group connected to the Iranian language group and part of the Mongol race. They became a dynamic force by domesticating the horse and becoming great horsemen and archers. They moved in tribal groups with horses and wagons living in stout felt tents, drinking horse milk from which they made cheese, and fished and hunted game. Their excellent horsemanship gave them a great advantage in war: they were said to be fearless and their woman were also great warriors. The Greeks referred to these women as Amazons. In 1949, a Russian archeologist, Sergei Rudenko opened a 2500-year-old burial tomb (kurgan) belonging to the Scythian people. This tomb is located in the high steppes of Mongolia at 5400’, where the Scythians buried their warriors and royalty. 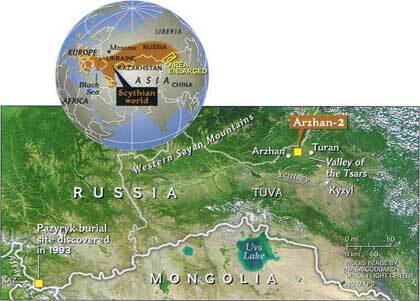 The Scythians build more than a thousand tombs in this vast region, which speak to their belief in life after death. The Pazyryk Rug along with decorated horses; weapons, gold artifacts, food and other textiles were found alongside the bones of their warriors and tribal chiefs. Herodotus tells us that these tombs were thought of as gateways to another life. Huge tombs as big as football fields were dug down deep into the earth and buildings erected with the wood of the long-lasting and thus sacred larch tree. The esteemed among the Scythian tribes were buried here and layers of rocks sealed the tombs. Scythians used heavy copper nails to secure the coffins believing that the entombed did not die but only passed onto another world from within these coffins. Most of these tombs were subsequently robbed of their rich loot. When the tomb that housed the Pazyryk Rug was robbed, water seeped through the tons of rock atop the tomb and completely froze everything inside the massive grave. It is because of this completely frozen and dark environment, that the Pazyryk Rug was wonderfully preserved for over two and half millenniums. The symbols within this magnificent carpet speak to the Scythians deep connection with the metaphysical, celestial, and animal kingdoms. The center motif is thought to have magical significance: pairs of rosettes or lotus blossoms surrounding a solar symbol are thought to represent their attunement with the sun. The winged griffins in the next border are part eagle and part lion – guardians of the path to salvation. In the next border a total of 24 broad-antlered spotted deer represent the tree of life. From the earliest histories, the stag has represented longevity and wisdom. The next border with 28 horses and their riders traveling in the opposite direction of the deer, represent power, nobility and valor. Each saddle blanket on these horses has different tree of life motifs woven into the design, which speaks to the hope that this textile would carry continuity and longevity for the tribe. Through chromatography, we know that the dyes were created from local insects and plants and exhibit a refined palate. This sophisticated dye technology was not thought possible by ancient people. Through our relationship with the Cultural Survival rug weaving projects, The Magic Carpet is proud to offer a collection of Pazyryk Rugs that are hand-carded and hand-spun and vegetable dyed – like the original. We offer squares in all sizes and runners as well as the ability to fulfill special orders. You may view this collection here on our web site.